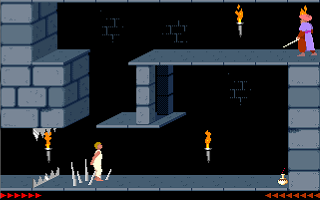 Description: Fairly easy levels, some sections similar to the original game. new comments and replays. comments: stuck @ Level 9.
can't get to the rightmost gate in time. tried to upload an *AVI file in the REPLAYS section, but it seems to be an unrecognized format. i'll do my best to describe the situation. 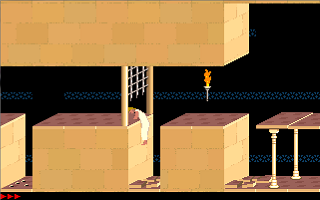 when i enter the level, there is the rightmost gate below with a guard. i go down, kill the guard. i go up, then to the left room, move up a room, and activate the gate switch. however, with the spikes, i just can't run to the rightmost gate with enough time. hope you could help me out. The website only accepts SDLPoP and MININIM replays. I didn't realize there was a shortcut. I went back to the entry room using the same route. here's a tip for Level 12: DO NOT FIGHT YOUR TWIN!